I completed a nice little project today. 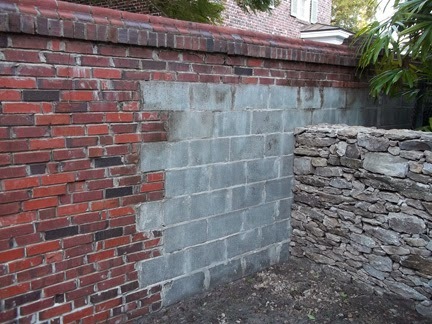 The assignment was to paint some concrete blocks to match the existing brick wall that the blocks were a part of. 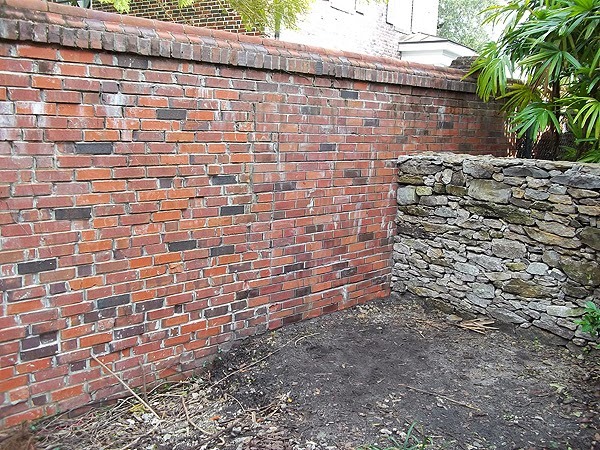 This brick wall is in the front yard of a very beautiful home in Tampa, Florida. The new home owners discovered that after they cleared up some bushes this is what they saw. When someone is driving down the street they can see this rather odd arrangement of block and brick. So the job is to paint the concrete block to look like the existing brick. The first thing I did was clean the blocks and prime and apply a base coat of paint. After the base coat of paint dried I mapped out the brick pattern. Luckily each concrete block was exactly 3 rows high of brick. That made the job way easier. After the first day I had a good start. Notice I am also painting the top two rows of block beyond the stone fence which blocks off the backyard from view. The thought being that from the street you can see back but not below the stone fence. Matching color is always a challenge on projects like this one. 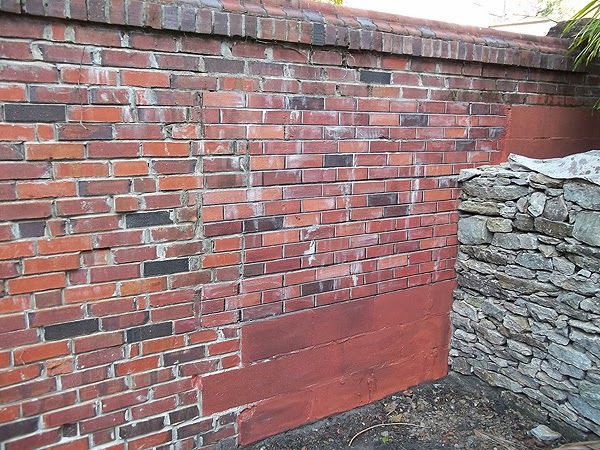 Here is a photo of the complete job and I think I did a great job of matching the color of the bricks. From the street you cannot tell at all that the bricks I painted on the concrete blocks are painted. It's a seamless transition. Pretty amazing really when you look at the first picture and then this last one. 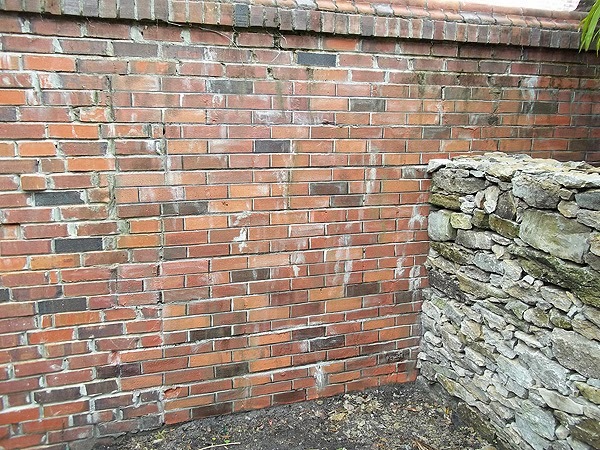 You did a fantastic job on this wall. Thanks Traci, A challenge for sure but it came out great. I used exterior Sherwin Williams paint. I did not use a sponge but just a regular paint brush on this. I did use a primer on the concrete block before painting also. I think one of the things that really helped on this one was to use a shadow line in the grout area to make the faux brick look like it stands out some from the block they were painted on. Diana, I used Sherwin Williams exterior paint but you can use an exterior paint just use a flat or eggshell nothing higher in sheen. As far as the exact names of the colors I don't remember. I had a color chart and standing in front of the bricks I matched up what I thought would be the base color to paint on. Then I used a dark brown called Black Bean to darker some of the bricks and added different other colors. Basically I had about 6-7 cans open. I have a lot of paint and so I just mixed and matched until it looked right. The trick at the end is to brush over the bricks with a dry brush technique. That is where you have practically no paint on the brush. That leaves it with a real close look to the brick texture. Yes, if you live in the Tampa Bay area. Did you use a stencil? Or did you use a sponge? 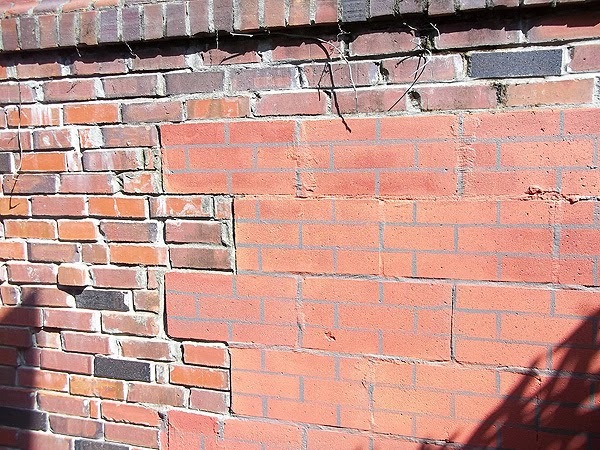 How did you get the bricks to be the same size/shape? Thank you! No, I didn't use a stencil. After the base coat dired I just used a 4 foot level and made the horizontal lines with a pencil. Then made the vertical lines. Then I used a small stiff brush and painted in the grout lines. Then painted in the bricks. Painting in the grout first I could see them so after I painted in the bricks so I went back and repainted the grout lines solid. What gives it the 3d look is I painted a highlight on the top and left side of the individual bricks and a shadow on the right side and underneath of the brick. The dark shadow was painted in the grout line but the highlight was just a thin light line painted on the brick. Luckily the concrete blocks I painted were almost 2 bricks wide and 3 high so that worked out pretty good. I use a simple wooden yard stick to measure. That is the coolest thing ever! cinder blocks are ugly, so I did some tinted mortar smear over mine, but yours looks much better!